I’m not saying that all Josh Meyer’s are ugly, or that a cool name always leads to a beautiful face, but you have to admit there’s a correlation. Good news for all the Josh’s in the world (a.k.a. almost everyone). The rate at which parents are punishing their kids by naming them Josh is declining. This could mean one of two things. Either people are getting more creative when they’re naming their kids, or Josh’s have just made a bad impression on the world. 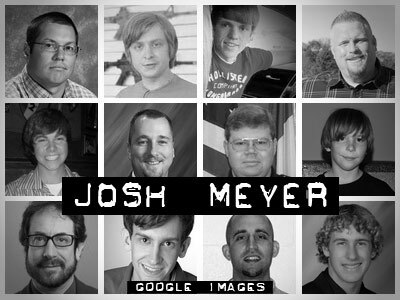 Although none of these are really me, I’ve come to the conclusion that everyone who has the name Josh Meyer looks like a geek. The heating guy from Trane won’t stop calling me Jason. I received a package addressed to Josh Meir. My fiance has a way cooler last name than I do. According to howmanyofme.com there are 653,932 Joshua’s and 314 Joshua Meyer’s in the US. 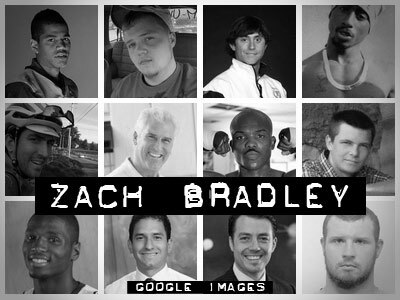 According to Google there are at least three Joshua Daniel Meyer’s. One is me, one is a todler, and another one, who happens to be the same age as me, is chillin in a correctional facility. I think I finally found my long lost evil twin brother. Despite having the easiest name in the universe to remember, people are always getting my name screwed up. I just don’t understand how Josh can be confused with Justin, Jeffrey, and even Jennifer. Well I suppose cuz they’re my siblings and we all start with J, but Josh’s make up like 70 percent of the population. You can’t really go wrong calling somebody Josh, so why call somebody anything else? I didn’t even know that the heating guy from Trane knew my name, but apparently he doesn’t because he calls me Jason. And that’s definitely not the first time I’ve been called Jason. I just may change my name to Jason to make everybody right. Or maybe I should just delete my name so I answer to everything. Pay day isn’t usually that exciting for me. Don’t get me wrong, I love to earn money. But unlike some people I know, I’m not usually broke by the time pay day comes around. And besides that my check is direct deposited, so it doesn’t really make that much difference. But on Friday when I took a quick look at my pay stub I noticed an “Important Note” in the corner. It said, “Effective this pay period your name has been changed.” I squinted and stared at if for a second. Then I thought, “Well cool, it’s about time I changed my name. I’ve been stuck with ‘Josh’ my whole life.” But then there was the question burning through my skull… Huh? What did they change it to? While I’m in the mood to make fun of myself, here’s some more convincing evidence that I don’t have a life. -Half of the people that call me at work were trying to reach a different Josh. -In any given day I can be called any combination of the names of my three siblings. -I’ll likely share a bunk bed with my little brother until the day I buy my own house. -Most of my socks are hand-me-downs. -I got called stupid by a 7 year old girl. -Someone was complaining to me about having to stare at a computer screen all day. I stare at one all week, all month, and…well you get the idea. -Everyone is always nice to me; people are never nice to people they like. -I’m one of only a handful of people in the world who think video games are boring. -I’ll interrupt a conversation to point out a sign that says Deli Chicken Donuts. -I instant message my brother at 11 pm while he’s about five feet away from me. I was looking today at the website of a graphic designer named Josh Meyer. The more I think about it, the more I realize that my name is…well less than unique, to say the least. This isn’t the first time I’ve realized it, of course. In fact, I’ve become so used to hearing the name Josh, that I don’t even look anymore when I hear my name called. I did a search for Joshua at the Social Security Administration website and it came up third for the most popular male name. That’s just rediculous if you ask me.